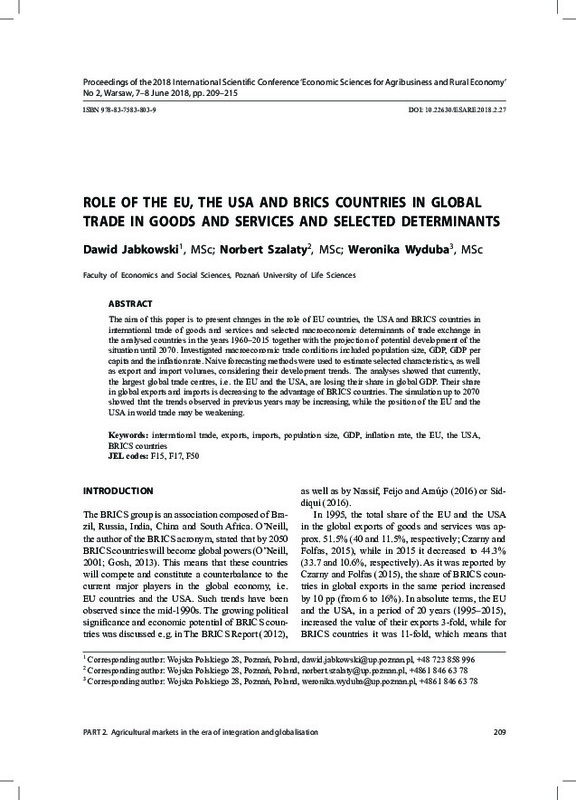 The aim of this paper is to present changes in the role of EU countries, the USA and BRICS countries in international trade of goods and services and selected macroeconomic determinants of trade exchange in the analysed countries in the years 1960–2015 together with the projection of potential development of the situation until 2070. Investigated macroeconomic trade conditions included population size, GDP, GDP per capita and the inflation rate. Naive forecasting methods were used to estimate selected characteristics, as well as export and import volumes, considering their development trends. The analyses showed that currently, the largest global trade centres, i.e. the EU and the USA, are losing their share in global GDP. Their share in global exports and imports is decreasing to the advantage of BRICS countries. The simulation up to 2070 showed that the trends observed in previous years may be increasing, while the position of the EU and the USA in world trade may be weakening.